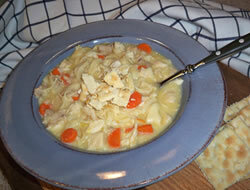 A winter favorite comfort food – warm chicken noodle soup gets healthier and easier. Not only is it packed with antioxidant-rich Super Spices, it’s also prepared in the slow cooker, so you don't have to tend to it as it simmers. 1. 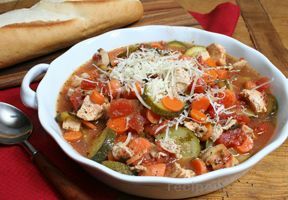 Place chicken, tomatoes, carrots, onions, oregano, rosemary, thyme and sea salt in slow cooker. Pour water over top. Cover. 2. Cook 4 hours on HIGH. Stir in noodles and oil. Cover. 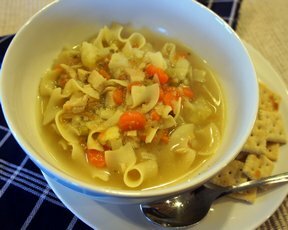 Cook 15 minutes on HIGH or just until noodles are tender.Slow Cooker Tip: For best results, do not remove cover during cooking.